I was taking a quick look at the press materials, and Moser Baer PV presented a few slides on their Photovolaltaic strategy. I expect Solarvalue will place this presentation on their website soon. The Solaria Supercell has a striking similarity to the Stellaris technology presented at 19th NREL Industry Growth Forum. This photo is also on the MBPV website Technology page. 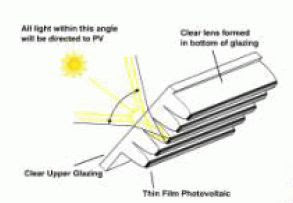 Per the grainy diagram from the presentation which I presume relates to Solaria, strips of thin film are used by this low concentration approach, not multicrystalline silicon. I will examine this in further detail later. Also, please see my previous post, Solaria spills low concentration photovoltaic technology at Symposium. It appears the diagram in the presentation =is= from Stellaris. I am still rooting into the details, but Stellaris is in a bit of a tizzy over this. Stay tuned for a clarification post. Can you please send me the link of the presentation of Moser Baer PV strategy? You mentioned this in your post…I worked as n intern in Moser Baer’s PV plant for about two months and need this info for my research project.. The presentation is here on the Solarvalue AG website. I have reason to believe this .ppt is not entirely accurate.